If you follow my blog you know I love wood. I love working with it, I love it in decor, I use it often. Today, this post appeared as part of a Houzz article on an initiative in San Francisco to create pockets of nature inside the urban landscape. This wall piece was one of many samples. 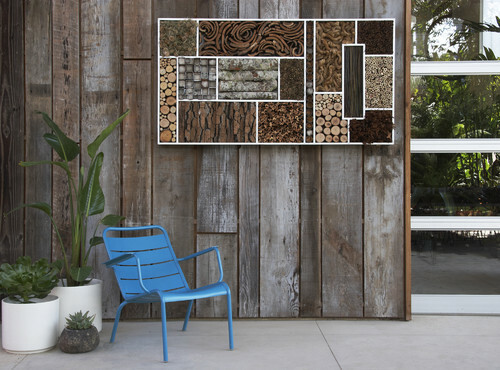 I love how wood in various forms is used to create a collage. and it reminds me of my branch series all combined into one work of art. The above panel is created by artists Lisa Lee Benjamin and Kevin Smith. They are part of group called Urban Hedgrow and consider themselves "instigators" working to create public awareness of the environmental processes happening around us. I see it as a great piece for inspiration.